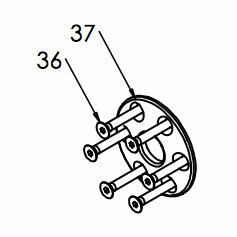 Install the Propeller with the supplied Propeller Plate (#37), and Bolts (#36). Put the Bolts into the Propeller Plate and then through the Propeller. 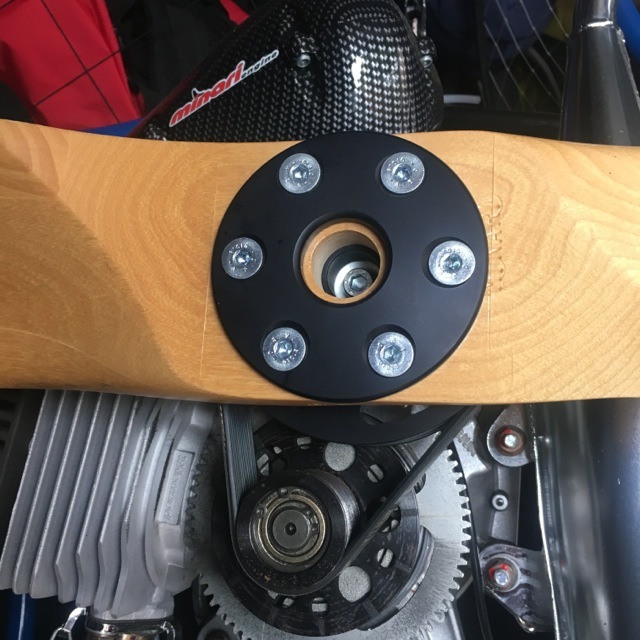 Slide the propeller onto the centering ring of the hub and find the bolt position so that they may be easily engaged by hand. Before fully tightening, check that the Propeller is installed correctly. The Leading Edge has the thicker edge and the trailing edge has cooling fins. The cooling fins should face away from the motor. If the propeller is installed backwards, you will have no power when launching. Tighten one bolt gently, just until there is a small amount of pressure. Cross-tighten the opposite bolt, then use the same cross-tightening technique for the other four bolts. Now cross-tighten the six Propeller Bolts to about the amount of pressure your pinky can pull against a 6-inch wrench. Install a good Propeller Cover for protection whenever you are transporting your Miniplane Minari Paramotor. The next step in the assembly is to Prime the Engine.